Each panel is approximately 26 inches tall and 31 inches wide. You are getting 8 panels so your total width is 31 inches x 8 (over 20 feet long!). Designed for both indoor and outdoor use, the 8 Panel Play Yard is an excellent solution for creating a safe enclosed area for kids and pets anywhere from the backyard to the playroom. Made of durable, weather-resistant plastic, this portable play yard is large, it provides 34.4 square feet (7 feet corner to corner) of protected play space, and it can be reconfigured into different shapes to fit a variety of spaces. For added convenience, the play yard sets up and breaks down in a matter of seconds. Do you want to keep your dog nearby while you spend a few hours in the garden? Or finish chores in the house while keeping the little ones safe and entertained? The 8 Panel Play Yard makes it all possible. 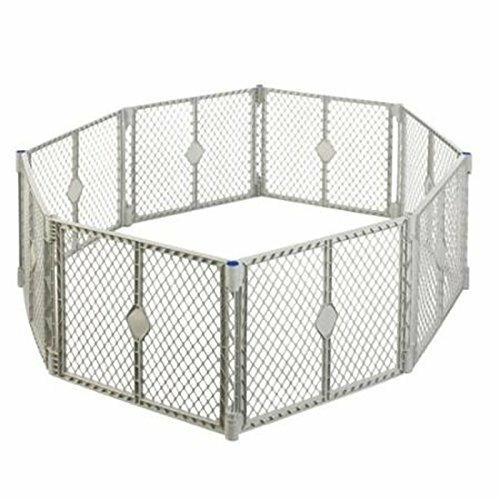 Weighing less than 30 pounds, this lightweight gate folds flat and even comes with a carrying strap, making it easy to carry everywhere from the park to the babysitter's. Easy to Assemble and Adjust. Setting up the 8 Panel Play Yard is hassle-free. The eight interlocking panels are pre-connected--simply pull the panels out of box, unfold and connect them together, and the 8 Panel Play Yard is ready for use. To put away, simply disconnect one panel, fold together, and store. If you have any questions about this product by Playards, contact us by completing and submitting the form below. If you are looking for a specif part number, please include it with your message.